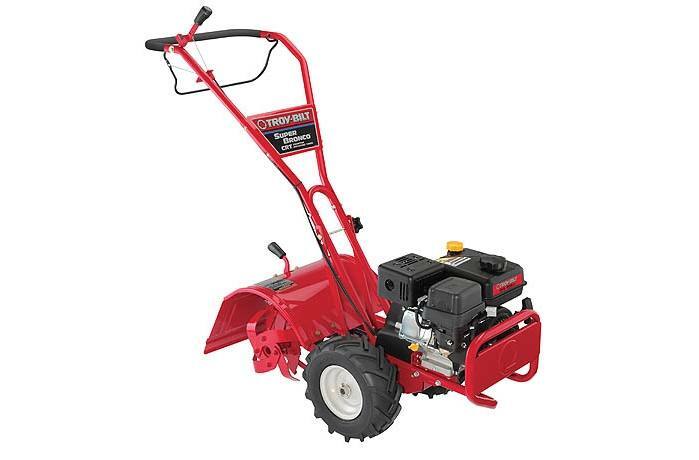 Just One Hand® Operation: Just One Hand® operation lets you guide your Troy-Bilt® tiller with literally one hand. Because the machine is engineered to be well-balanced and easy to control, it does the work - not you. Cast-Iron Bronze Gear Drive Transmission: Our tillers use a patented cast-iron encased transmission with bronze gear drive that provides so much extra strength and durability, we cover it with a limited lifetime warranty. Patented Bolo® Tines: All Troy-Bilt® tillers feature patented Bolo® tines, which are three uniquely shaped tines. Each tine is designed to do a separate task, yet work together to create finely tilled soil, ready for planting. Tilling Depth: Adjustable up to 6 in. Warranty: 2-year limited manufacturer's warranty - refer to online operator's manual for exclusions. Limited lifetime warranty on transmission. 2-year manufacturer's warranty on engine.